Savamala – A Place for Making is the outcome of a six-month process in which students proposed different approaches for revitalizing the community space in the neglected Belgrade district of Savamala. We worked primarily with two spaces as relational objects. One was a studio space in Savamala, Studio KM8, which Urban Incubator provided for us. Before the project started, it had been unused. Studio KM8 became a platform for rebuilding the idea of a shared space. The second space was Župa, an old abandoned steamboat moored beside the river bank in Savamala. Through collective performative actions we exemplified possible uses of the available space on Župa. Together with the neighbourhood, residents, students from Belgrade, and other culture producers who engaged with us throughout our residency, the two sites were activated as community spaces for sharing skills and knowledge. At both places we initiated and assisted with the formation of an association that would continue to engage with the residents of Savamala and make Studio KM 8 and Župa a place for the neighbourhood. The class Design for the Living World (HFBK Hamburg) was invited by the Urban Incubator (Goethe Institut) to work in Savamala. Our practice is research-based and cross-disciplinary. We focus on participatory design projects in which students collaborate with local residents in the tradition of learning by doing. Location: Studio KM8 and Župa boat in Savamala, Belgrade, Serbia. Students: Finn Brüggemann, Maria Christou, Basak Göl, Johanna Padge, Johan Romme, Amalia Ruiz-Larrea, Julia Suwalski, Nuriye Tohermes, with guests of the class Ron van den Akker (artist, lives in Berlin), Jana de Jonge (Kunstakademie Karlsruhe), Emilija Josipović (free-lanced architect, Belgrade), Maja Mijatović (HCU HafenCity University Hamburg), Olivera Petrović (free-lanced architect, Belgrade), Mai Shirato (designer, Hamburg), Nele Urbanowicz (Buchkunst / Burg Giebichenstein Halle), Radoš Vujaklija (Time-related Media, HfBK Hamburg) and Tessa Zettel (artist, lives in Sydney). The Class of the Design for the Living World in collaboration with: Residents of Savamala and groups active in Savamala, including Iva Milovanović and Jovan Ćurčić (Applied Arts Academy, Belgrade), Drustvo Savamala, Goethe Guerilla and many others. Special thanks to: Akash Bhatt, Ivan Kucina, Dušan Milanović, Predrag Milić, Nebojša Milikić, Žarko Obradović, Natalija Ostojić, Vesna Ristić, Stefan Savić, Dubravka Sekulić, Daša Spasojević, Miško Šuvaković, Vanja Terzin and many others who shared skills and knowledge with us. Supported by: Goethe Institut Belgrade, the City of Belgrade and the Municipality of Savski Venac and Hochschule für bildende Künste (HFBK) Hamburg. Performative actions are an important part of redirective practice: they demonstrate the process of cultural remaking. Performative actions were the ceremonial washing, cleaning, and rechristening of the boat; Zimnica I, Zimnica II, Župa Sounds, textile workshop, domino tournament, open-air cinema, New Times for Župa, among other things, and workshops and gatherings at the Studio KM8. 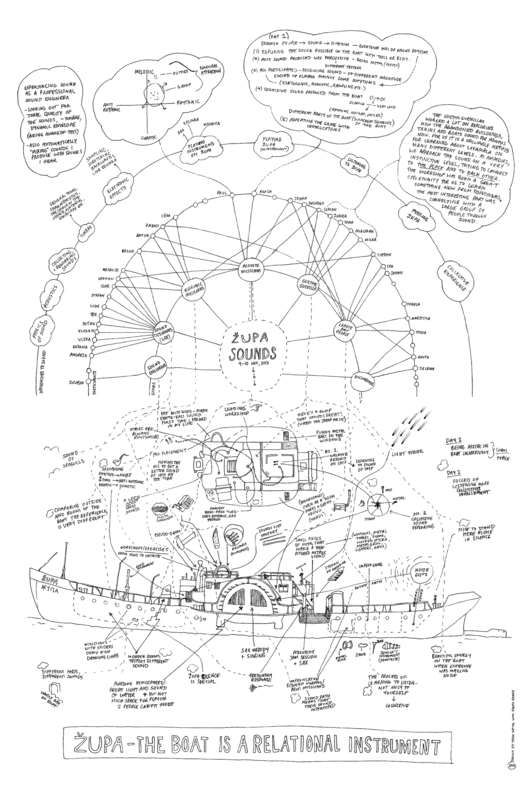 On the Župa boat, collective performative actions create new images of public activities. The Studio KM8 is a platform for rebuilding the idea of a shared space. Here, groups that share the workshop space form an association that can serve as an agent and practice for developing the commons. Relational objects are tools that communities use to change their culture of living. The Župa boat and the Studio KM8 are available spaces that are being reclaimed for the Savamala community and transformed into places for sharing skills and knowledge. An abandoned boat rethought as an available space becomes a place where community groups in Savamala have space for workshops and community gatherings. By sharing skills and knowledge they become the users and caretakers of what has been a “no-man’s land” in a period of endlessly delayed privatization. The Župa Sounds project brings together various participants to explore sound-making, encourage a broader reflection on our understanding of sound, and strengthen existing networks in Savamala. The project presents the power and potential of an workshop that chooses to make the opinions of its most important users in the city, the residents, count once more. 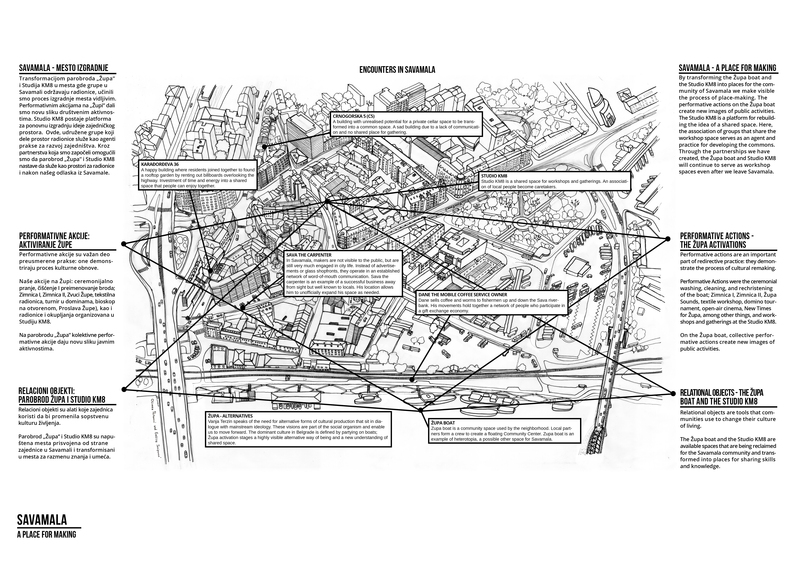 The intention of this art project is to draw out parts of the unseen and unheard life of belgrade citizens and, in particular, the life of the savamala citizens. With our work we stimulate social change through collective craft practises. Savamala Diary with Beuys Tree and Stone includes a diary, an oak tree, and a stone erected on the Savamala riverbank in front of the Župa boat. The diary uses storytelling to document the ways Belgrade citizens relate to Savamala. We, the students of Design for the living World from the HFBK Hamburg, have been using the Savamalski Dizajn Studio at Kraljevica Marka 8 from September until November 2013 as part of the Urban Incubator project. As a class we make participatory projects, which work together with a local community. We want to function as a collective, sharing the space and using it for regular cultural activities. We plan to hold regular meetings to discuss the upcoming program, work out a timetable and distribute responsabilities among ourselves. Our work on Župa had a performative character as it intended to create images of gathering that can easily be understood by everyone. We used every-day activities to bring people together: cooking and eating, watching movies, making music, discussing and playing games. Activities that are easily accessible and that build a foundation for exchange with others. The class Design for the Living World, HFBK Hamburg, is interested in participating in Urban Incubator Belgrade 2014. We want to continue working on the two locations we developed as shared spaces in the project Savamala – A Place for Making during UIB 2013: Studio KM8 and the boat Župa. We are looking forward to working with the local residents who committed themselves to administering and organizing the programmes at these sites after November 2013: the members of the Association Studio KM8 and the partners of the future Župa Community Centre initiative, as well as with the networks established during UIB 2013.